The Angriest: Star Trek: The Next Generation: "Emergence"
It's 22 May 1994, and time for the ante-penultimate episode of Star Trek: The Next Generation. 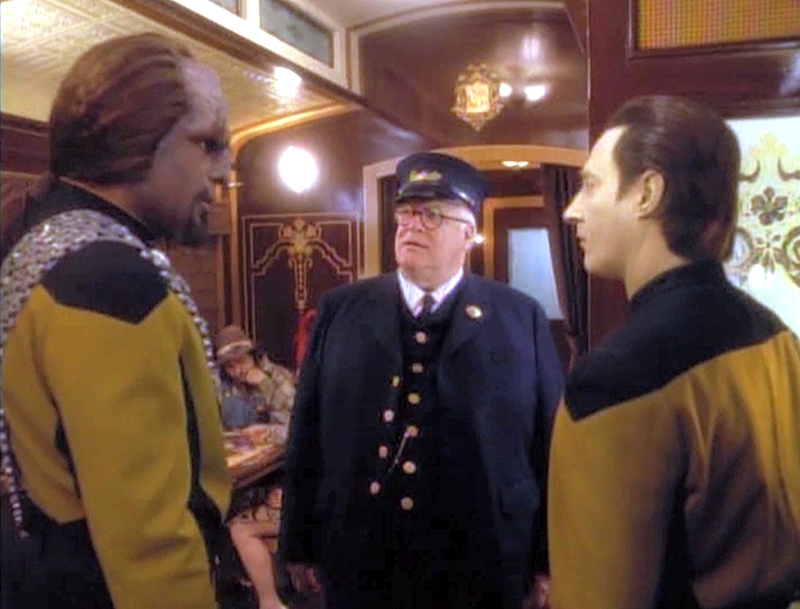 When a train crashes through Data's holodeck simulation, Picard (Patrick Stewart) orders an assessment of how the data glitch occurred. When the Enterprise unexpectedly goes to warp on its own, it becomes clear that the computer problems are more widespread. Entering into a mish-mash holodeck projection of the Orient Express, Data (Brent Spiner), Worf (Michael Dorn), Riker (Jonathan Frakes) and Troi (Marina Sirtis) attempt to get to the bottom of things. Two episodes to go, and with the clock ticking down on The Next Generation, it is time to take one last trip into the holodeck for a victory lap of surreality and whimsy. I really do wish that they hadn't. The holodeck, introduced all the way back in the series premiere "Encounter at Farpoint", has been a decidedly mixed bag for the series. Occasionally it has produced some properly entertaining science fiction and character drama. More often it has felt like an odd little quirk; a chance for the production team and the actors to have a bit of fun playing out of genre and character. "Emergence" does not give the regular cast the chance to dress up too much, but it overloaded with surrealist nonsense and quite egregious over-acting by the guest cast. It is all a representation of the Enterprise itself becoming self-aware and trying to essentially make itself a baby. Now the idea of a starship's computer network developing self-awareness is actually a pretty good one, but this episode is sadly a case of taking a decent premise and doing something relatively stupid with it. It's deeply unsatisfying. There's a peculiar sort of Season 2 vibe about the episode, which starts with a good starting point but then heads in a lot of odd and ill-advised directions. It all feels weirdly out-of-date, as if it was supposed to be aired in the 1970s. Quite frankly, it's probably worth giving the whole episode a miss. With 12 decent episodes out of 23, Season 7's quality ratio slips back to 52 per cent.